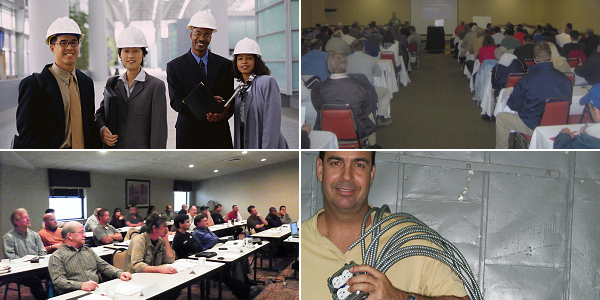 "When You're Serious About Success"
HVAC Associates provides result-oriented training and continuing education seminars for trades contractors and personnel, trade associations, code enforcement, facility maintenance, distributors and manufacturers. When you attend our training you can be assured of a real return on your investment. Our trainers are active experts that have a passion for teaching and decades of experience in their subject areas. They provide participants with up-to-date practical information, skills, and processes that are immediately beneficial. We pledge to provide more practical information based on current real-life experience, more insight, and more value to provide you with an unequaled learning experience. Our topics include: Technical, personal development, team development, leadership and business courses. We can modify existing programs or develop custom programs to assist you in meeting your specific goals. Our programs promote professionalism, positive change, personal and organizational growth and success. If you are not totally satisfied with your live seminar learning experience within the 1st. hour, … we will refund your investment in–full! Contact Us To Schedule A Seminar In Your Town!